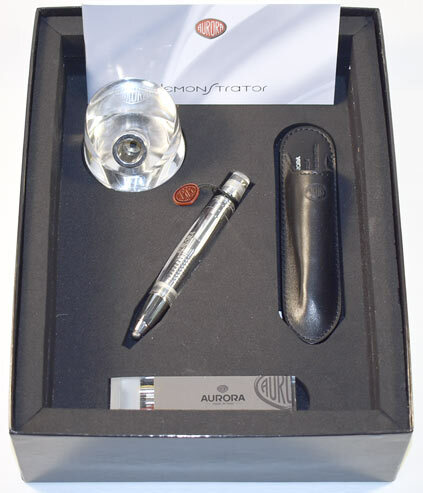 9385: Aurora 88K: black piston-filler, 13.7 cm long, chrome plated cap, piston seal has been replaced; as new, noting scattered age flaking of the chrome (see details), and barrel custom-imprinted for CEAT, the famous Italian tiremaker. 12730: Bayard Special Luxe: black lever-filler with blue pearl veins, 12.1 cm long, chrome plated trim, cap and barrel material is probably celluloid but may be casein -- do not soak! 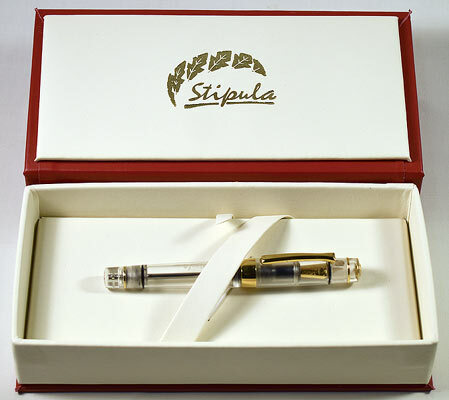 18K gold warranted nib, likely an old replacement; strong barrel imprint, some shrinkage to both cap and barrel, handsome overall appearance. 12732: Bayard Excelsior 588: small dark green French-made pump-filler, 11.8 cm long, gold filled trim, hooded nib, original chalk marks on barrel, superficial shop wear; original accordion sac has been replaced by a conventional sac, fill pen by twisting transparent plunger instead of pressing (as described here). 12764: Bayard 20/265: slender black French-made accordion-sac pump-filler, 13.45 cm long, gold filled trim, original sac intact, 18K gold nib, excellent appearance but some scratches to barrel. 12702: Edward Baker ejector dip pen: sterling silver, London hallmarks worn but legible, 15.4 cm long excluding nib. The end of the taper is spring-loaded; when pushed, the nib is ejected. Plunger spring has taken a set, so plunger does not spring all the way back, slight bend to plunger, small seam split at end of taper (see detail), but all fully functional. 13458: Foster penner: classic Sheffield brass writing compendium, 10.5 cm high, inset glass inkwell is unchipped, brass has some shallow bumps but none of the splits and deep dents often found on surviving examples. This design was made for decades, through the 18th century up into the beginning of the 19th, with examples in use in the Americas in the Revolutionary War era. Thomas Foster, "brass inkstand manufacturer", was listed at 51 Burgess St. in the 1820s, but apparently left the business to become a teacher of music. This penner could just as well have been made by his father, however. 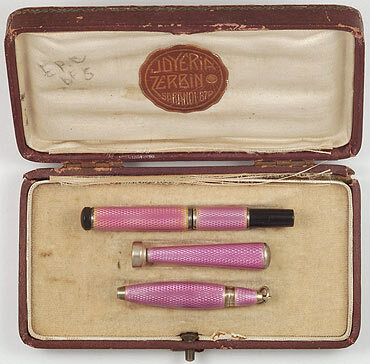 13431: Gold Starry button-filler: small burgundy model, 10.75 cm long, gold filled trim, 18K gold nib, made in France. 13101: Kaweco Westminster 21: small jade green button-filler, 11.8 cm long, gold filled trim, black hard rubber ends; strongly Kaweco in style and appearance, though Westminster has been listed as a Montblanc sub-brand -- may have been a retailer's house brand instead. #2 Montblanc nib, Montblanc notched feed, darkening to barrel, strong imprints, nick to cap lip and short barrel mouth hairline have been professionally sealed and are barely visible (see details). 13017: Mordan eyedropper-filler: black hard rubber straight-cap, 13.2 cm long, barrel imprinted "MORDAN/LONDON", overfeed with unmarked ventless nib; closely resembles a Wirt, possibly Wirt-made. 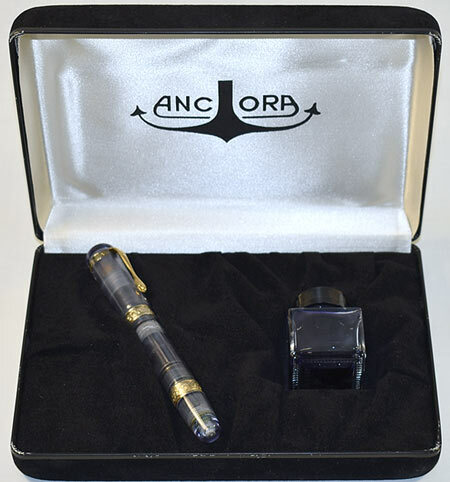 Mordan is best known for precious metal pencils and dip pens, but Mordan fountain pens are rare -- this is only the third that we have handled. Even fading, nib tipping is intact yet rather draggy on paper. 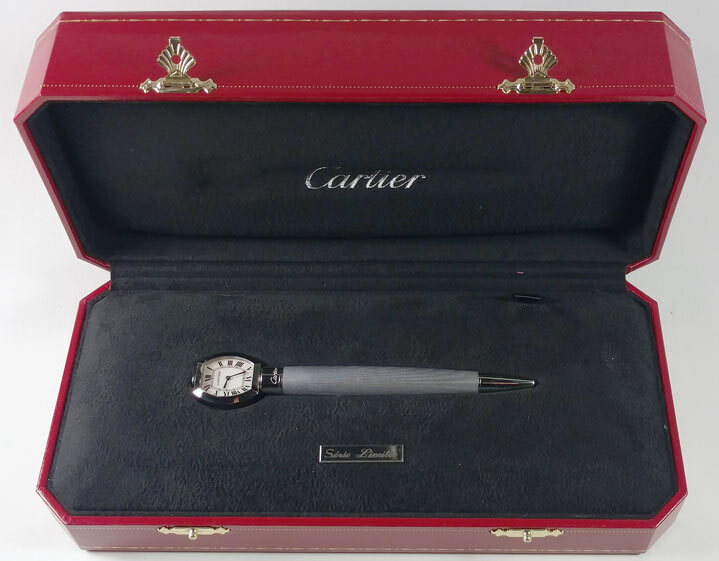 12105: Mordan Ejector dip pen set in box: patent dip pen in solid 9K rose gold, 15.3 cm long, ferrule body slides forward to eject a used nib without soiling the fingers; matching pencil uses 1.5mm "VS" lead, both engraved with monograms, but oddly the pencil bears "JRB" and the pen, "JEB". Box will not close fully, latch needs attention. 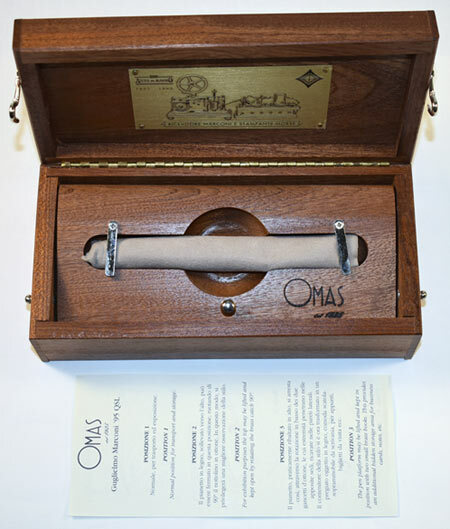 13666: OMAS Paragon: large black facetted piston-filler, 14.2 cm long, rhodium plated trim, roller clip, 18K white gold nib is a smooth writer; a few scratches on the cap, some plating wear. 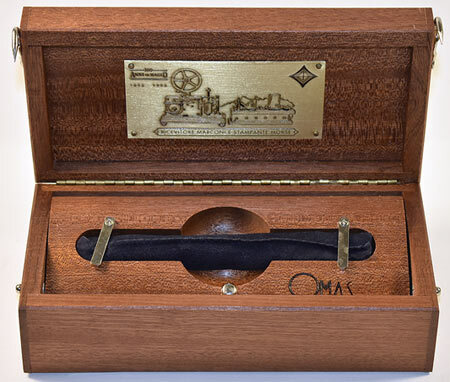 13886: OMAS 360 in box: oversize triangular cotton resin piston-filler, 16 cm long, gold-plated trim, blue-black, two-tone 18K nib, complete with instructions, guarantee, inner and outer boxes. 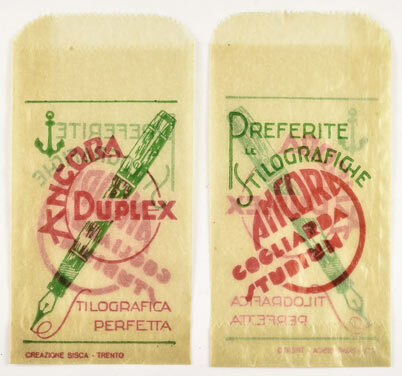 Two available, please specify nib choice. 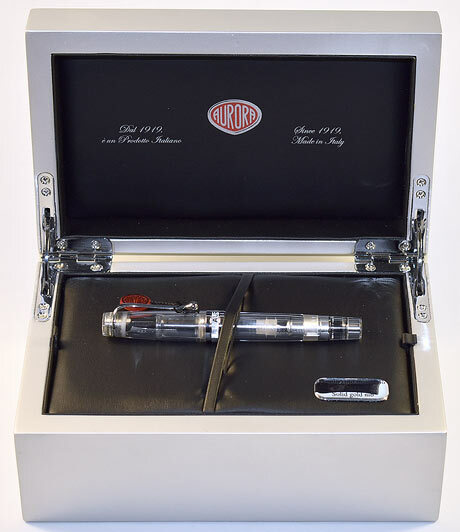 13867: OMAS 360 Vision in box: limiited edition (1000 fountain pens) transparent cotton resin piston-filler, 15 cm long, rhodium-plated trim, 18K nib, has been filled but as new, only sign of ink exposure is on the screw head inside the cap. 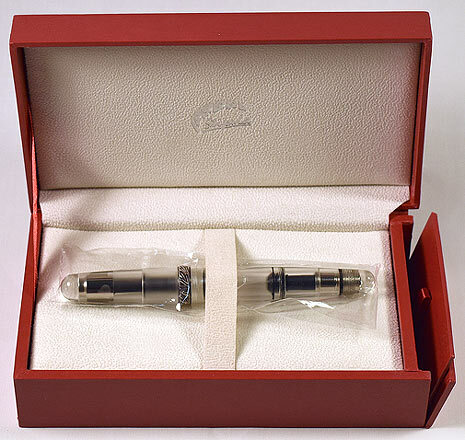 13203: Paillard Semper 183: black chased hard rubber screw-cap eyedropper-filler, 13.6 cm long, marked "IMPORTE ETATS-UNIS" and with a French-hallmarked 18K nib marked "MADE IN U.S.A." Paillard was a French pen company, but like many European makers sourced nibs and whole pens from the United States. 9862: Reform 1745: German-made piston-filler, 13 cm long, gold plated trim, green barrel with black cap and filler knob. 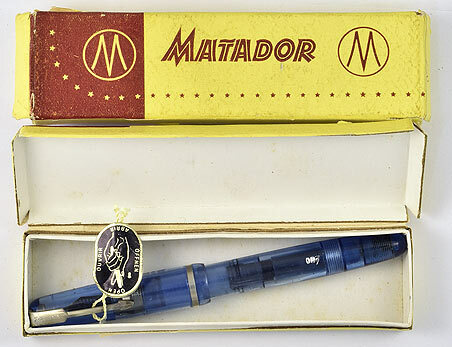 Pelikan-style screw-in interchangeable nib unit, two-tone plated steel nib, blue-tinted ink window. New old stock, with sticker -- several available. Please note that at this price, we cannot test and tune nibs as we do for our regular stock items: we are selling these as found, from the factory. 12725: Soma button-filler: burgundy, 11.7 cm long, gold filled trim, made in France, unusual feed matching in color, 18K warranted nib writes a nicely shaded line with normal writing pressure; slight irregularity of lowest cap band appears to be a manufacturing error. 13213: Unic button-filler: French-made gold filled ringtop, 8.9 cm long, responsive 18K warranted nib; several shallow bumps to metal but engine turning crisp, no brassing; tool marks on section. 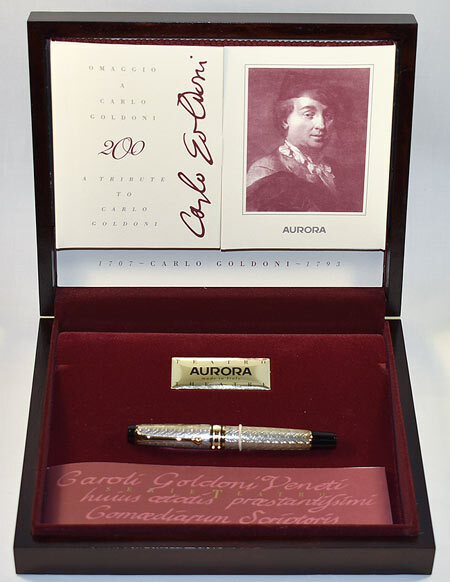 10574: Williamson button-filler: Vacumatic-style burgundy pearl laminate, 11.9 cm long, gold filled trim, made in Italy, very flexible long-tined Williamson nib, cap jewel appears to be a replacement (more rounded than usual conical profile).